Latest Technique Of Varicose Vein Treatment: "Endovascular Laser Therapy (EVLT) Of Varicose Veins"
The standard surgical operation of high ligation & vein stripping (HL/VS) was historically considered the best way to eliminate incompetence using ligation of the saphenous vein at its deep vein junction and removal of the abnormal saphenous vein segments. HL/VS has essentially been replaced by percutaneous endovascular laser treatment (PEVLT) which is a procedure of thermal ablation that is accompanied with high success and low complication rates. PEVLT is generally performed on an ambulatory basis under local anaesthesia and typically requires no sedation. Recovery period is short. EVLT is the only minimally invasive laser treatment for greater saphenous vein reflux with long-term clinical evidence. With more than a 10-year follow-up with data proving the exceptional safety and efficacy of the procedure, practitioners and patients feel confident about EVLT, thus avoiding the commonly met side-effects of surgical vein stripping. EVLT is the most widely practiced minimally invasive procedure in the world for the elimination of varicose veins. EVLT is designed to be a 30-45 minutes office procedure. You walk in, have the procedure and go out. EVLT is performed only under local anaesthesia. No general anaesthesia is needed. EVLT knows a 98% success rate. EVLT needs no hospitalization. You can walk out of the clinic on your own feet 1 hour after the procedure. EVLT shows a very low risk of complications. EVLT allows a fast return to normal activities. You need to keep yourself mobile and active. EVLT is reimbursable by many health insurance plants. Targeted laser energy seaks the greater saphenous vein shut, shrinking the branch veins. Thermal ablation causes contraction and permanent occlusion of the blood vessel being treated but with minimal effects beyond the vessel wall. Around 40% of women and 25% of men suffer from bulging leg veins due to greater saphenous vein reflux. Now EVLT can be offered as an effective alternative to painful surgery to this significant patient population. From the advanced world of minimally invasive laser treatment comes a safe fast effective treatment for a pervasive element that affects the quality of life for millions of people worldwide - the twisted and bulging veins of the greater saphenous vein reflux. Twisted bulging veins represent an enormous problem worldwide. It is estimated that 80 million Americans alone suffer from bulging veins of greater saphenous veins reflux. 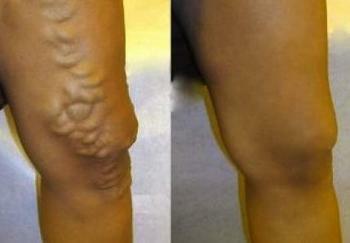 But bulging veins are not just a cosmetic problem. Many people suffer symptoms such as pain and swelling. These painful veins can have a major impact on lifestyle and are responsible for the loss of millions of working hours worldwide.